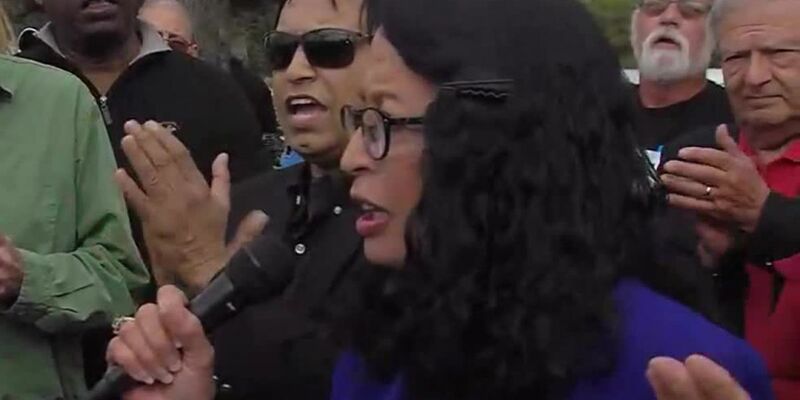 PALM BEACH COUNTY, Fla. — Suspended Palm Beach County Supervisor of Elections Susan Bucher spoke out at a rally on Monday for the first time since Gov. Ron DeSantis removed her from office. "Today I stand before you willing to fight for democracy and justice, Are you with me? Are you ready to fight with me? I’m ready to fight about it,” Bucher told supporters outside the office she was forced to vacate last Friday. Bucher added that she's exploring her legal options. "The Governor's actions of removing duly elected public officials should send a chilling message to any elected official who goes against the Governor," said Bucher. Gov. DeSantis suspended Bucher on Friday after her office failed to meet a mandatory recount deadline in the November election. "I think there were a train of problems," said Gov. DeSantis at a news conference. "It's not just, there was a mistake here, a mistake there. It really tarnished the image of the state of Florida. I want to make sure it doesn't happen again." On Monday, Democrats rallied in support of Bucher at the Supervisor of Elections Office at 240 S. Military Trail in suburban West Palm Beach. Directly across the street from them, a group of Republican supporters held a counter protest, holding signs in support of the Governor's decision to suspend Bucher. The Governor replaced Bucher with Wendy Sartory Link, an attorney who plans to serve until 2020, but won't seek re-election. "I love being a change agent," Sartory Link told WPTV on Friday in an exclusive interview. "I love going in and figuring out what’s the best that we can do here, and how can we make what we’re doing here that much better?" Link said she's determine to replace voting machines, which malfunctioned during the November recount. Bucher spoke to WPTV in November about the controversy surrounding the recount. "As the supervisor, I take full responsibility, that’s my job," Bucher said in November. "It’s not for lack of human effort. The human effort was incredible and I thank everyone. But the fact of the matter is when there’s mechanical failures, there’s not much I can do about it." “I’m reviewing my legal options,” Bucher said as she left the rally.